Please stop Adding speculative information on the Super Mario Wiki. This isn't a warning, and it's possible that you made a mistake by accident or without realizing it; this is simply a reminder for your information. If the action continues, then a warning will be issued. Thanks for reading and keep contributing. 27 Want to be friends? 31 please speak english and come on, click the link! Hey SuperMariosuperfan how about you put more on your user page because you only put like 1 or 2 sentences and 1 image. Well how about looking at my page because it is awesome. Hi, I see that you like Mario a lot, just like me! I feel a bit lonely so could we become friends and talk about Mario? Sorry, I wasn't able to talk to you recently because I was banned from using internet. Can you please answer a few questions for me? I heard in some internet gossips that Mario is addicted to mushrooms. Is this true? There is also this debate going on: Is Mario fat? No sorry, I don't know. I don't want to beat the record for most userboxes but I'm counting on you! (*thumbs up*) Am I writting 5th in a row? Ah well, thenks for telling me! Will you send me some birthday wishes? I'm going to have a Mario themed party and I'm dressing up as Princess Peach. It's in 18 days!!!! I can't wait!! Am I writing 6th in a row? Well.. with my birthday party... Sorry I can't invite you because it's for my friends from school. But I will tell you how it went. 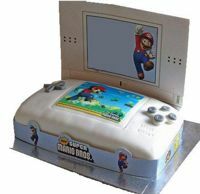 I am going to have a Mario cake (you get them in Tesco's. Should we add an article about them?) and some other food. I need help to get the Mario quiz done. I need some almost impossible questions (15 will do), will you help me to organise it? I like the queastion with Koopalings. So we have two now. If you think up of any more let me know but don't give the answer (I want to have some fun too). With the bomb-ombs I made up a story where Mario gets a bomb-omb from Bowser disguised as a Toad and Mario says: "Oh, a Bomb-Omb. Thank you very much I will keep it for the next Mario Kart tournament. Hey, it's beeping! Hang on... IT'S GONNA EXPLODE!!! EVERYONE EVACUATE THE BUILDING!!!!!" (And Peach's castle is ruined). I have another question fro the quiz: What is the latest Mario game released (Would Japan count?)? PS. This user called "Sonic Rocks" was accusing me and wrttten heaps os stuff on UnMario, Mario Wiki Polska and Userpedia. PSS. I live in Scotland (Yep, that's where men wear skirts) but my first language is Polish. That's why I became an administrator in here. It's a VERY small wiki beacause I don't get a lot of users. Thanks for the question, I'm trying to get a total of all Mario games released but it's hard because I don't know if releases on multiplatforms should count or not. And I don't know what you mean with the userboxes - are you trying to get as much as possible? Good luck with it! I hope you will soon reach 1 000. Thank you so much for the wishes!! I remember that once a user known as "Sonic Rocks" has been nice to me so we got each other's friend and Wii code but then he started spamming me via Wii messages and witten heaps of bad stuff on userpedia and other sites. I need to be very carefull now but thanks for good words!! Are you from America?!!!? Cool, I see that your spelling is quite different and America seems to be on the end of the World and Japan on other. Hey you look a HUGE Mario fan, do u like Super Mario 64? It's my favorite Mario game, I like it so much dat i have it on N64, Wii, and my comp (besides some cool! hacks of the game i found on the webz). I'm lonely on this wiki and please will you talk to me about SM64? I don't want to talk about this but I'm forcing myself to explain this to avoid any other questions. Not a lot of users but only one user who sockpuppet'd was being not very nice to me. I try to forget about it all but it's hard because I still have nightmares about that. Please, don't ask any more questions about that subject. Anyway, I'm suprised that you're almost exacly the same age as me!! (We must be soulmates). Congrats with the method of invisible ink!!! How many Toads are there in Paper Mario 64? How many Marios can you see on this page? List 10 Goomba species besides the original Goomba? What are you sorry for? Anyways, "soulmate" means that someone is quite similar to the other person, that could understand the other person and has the same interests. The shy guy question completely gob-smacked me. There are 10? Wow, thanks for the questions! You've really helped me!! Now I got another problem: What Mario-themed birthday party games we should play? PS. How many beans are there in Mario & Luigi: Les Freres du Temps? A birthday party with only 3 games? Anyways, we're going to play on Wii/DS. But will you answer this question for me: How many bean are in this game? I've deleted all data on purpose so I could complete the game without Action Replay. It's even easier!!! Thanks for the ideas! You don't have to think up of any more. Unless there are really good ideas. The food is going to be red-and-green. Red and green fruits (strawberry and kiwi)red and green drinks and red and green sauce dips. I will try to do mushroom muffins too! PS what colour is your DS? Mine's red. hi again Lol, Jamie and Pokémon Master screwed my account up so I changed to this one k? PSS: What games do u have for Wii? 1-What company used to be Nintendo's ally until 2002? P.S. the URL is marioluigi.wikia.com. The page(s) you recently created (Lost Gold Coin Mine) has/have been put up for deletion, has been deleted, or turned into a redirect. This may be because it violated at least one of the policies and/or guidelines of the Super Mario Wiki. There are some things you can do to ensure this doesn't happen again. Make sure there is no other article about the same subject with a different title, especially for conjectural articles. Make sure the article has enough information to make it a worthwhile read (i.e. it does more than state the obvious, such as "Luigi's Mansion is a mansion that is owned by Luigi"). Overly short articles are known as stubs and their creation is strongly discouraged; it is better to amass enough information to make a solid article right off the bat instead. Make sure the article is significant enough in the Mario series to have its own article. If the article has only been tagged to be deleted you can still fix or expand it, but an administrator may delete it at any time, so please act quickly. Thank you for reading, and keep contributing! Hi, I like your userpage. In a few words, a patroller is an user that can block or unblock an user and revert an user's edits. A sysop does the same thing but also delete, restore or protect pages and delete images. ¢oincoll€ctor PS: Tucayo is a sysop now. See ya! You can't delete an image in the wiki. You have to ask a sysop to delete the image you choose, and they will take away. Only sysops can delete images. Hey, Supermariosuperfan. Wanna be friends? Who cares, I still don't know what the heck your talking about, dodo! Thanks for the touching poem, but it didn't help me. I will give $100,000 if you click on this link. please speak english and come on, click the link! May you please just tell me in english, AND WOULD YOU PLEASE CLICK THE LINK ALREADY? I not messing with any sysops or patrollers, I'm just telling 2257 that I don't know how to make a sig. Did you just want to play the japanese levels? They're pretty hard, and you can play on your computer using this save file I got from somewhere lol. Do you want it? Super-Yoshi Talk? C??? I have two, just rename them the same as your rom. I forgot which on the japanese one is tho, but have fun :P Super-Yoshi Talk? C??? No its just a save file, and no its not illegal. Super-Yoshi Talk? C??? This page was last edited on March 26, 2012, at 07:17.